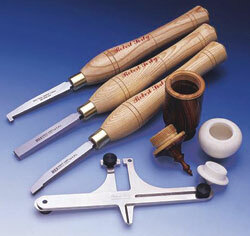 This system from Robert Sorby gives you everything you need to cut threads in your turning projects. Also referred to as thread chasing due to the repetitive style of cutting used to achieve the final depth. These thread cutting tools come in matched sets that are made of high speed steel to stay sharp longer. One tool is used for cutting external threads while the other is used for cutting the internal threads. Both tools feature a unique enhanced helix angle specifically designed for cutting wood. We offer cutters with 10, 16 or 20 thread per inch cutters. The cutters are used with the lathe running at a slow speed of 300 to 500 RPM. A video is offered to help the beginner get started with thread cutting. Each tool comes fitted with an Ash Handle. The Sorby Relief Cutting Tool is used to make a recess when chasing internal threads that are stopped. This is needed when making the lids for boxes and for other projects. The Sorby Thread and Sizing Gauge takes the guesswork out of making boxes with threaded lids. It is used to transfer the size from the bottom to the lid to insure a good fit between the internal and external diameters. The Basic Thread Cutting Set includes one pair of Thread Cutting Tools, Sizing Gauge and Sorby DVD. The Deluxe Thread Cutting Set includes one pair of Thread Cutting Tools, Sizing Gauge, Thread Chasing Armrest, Recess Tool and Sorby DVD.